We've been in Montreal for the last week. I was at a conference and the family came along for the ride. There has been much museum-visiting, walking of city streets and dodging of hefty Montreal showers. I'm not a huge fan of cities, but if I had to live in one I think Montreal might get my vote. Today we went out to the site of the 1976 Olympics (I had actually forgotten that the current Olympic Games started today). 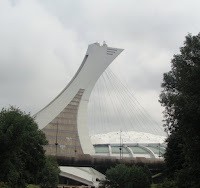 The Biodôme is a conversion of the 1976 Olympic velodrome into an indoor zoo with four ecosystems. It was very busy (probably due to the damp weather today) and overrun with kids from various camps who really made the experience quite grim. On a quiet day I think it would be a good excursion, but today was not that day. To the north of the Olympic park are the city's Botanical Gardens, which were wonderful. I didn't see as much of them as I would have liked (having the children along limits the distance I can walk), but the vegetable gardens were great. We learnt in the Musée d'archéologie et d'histoire that 70% of Montreal's land was given over to vegetable gardening in 1720, so it was good to see this tradition continued in the Botanical Gardens. We also saw the First Nations garden, which comprises native plants in three distinct zones. 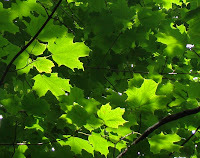 The leaves in the picture belong to a sugar maple in the hardwood forest section. I bet the gardens there were phenomenal. I don't travel much or get around to see those types of things, so enjoy it when people post photos and tell about it. I'm not much of a city person myself, though I live one block from likely the busiest street in town. My dream is to a have a one-room cabin out in the woods with my pets and garden to my heart's content.